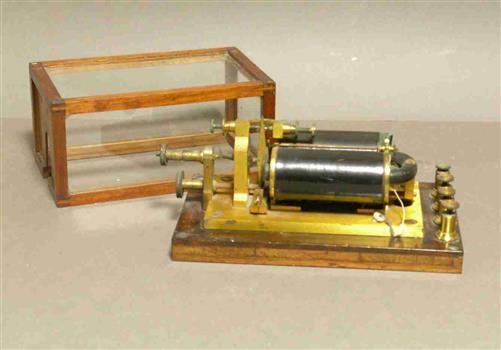 An electromagnetic relay device on a brass base plate, and mounted onto a wood base. It is covered by a removable wood-framed glass sided cage. The item has four terminal posts and an adjustable conductor mechanism. This item was probably acquired for, and used by, participants in telegraphy at the Ballarat School of Mines courses between 1873 and 1893.